Once the diamonds are formed, the gemstones will make their way to the surface through volcanic eruptions. The diamonds will then travel at a rapid speed with magma to the top of the earth’s surface through kimberlite pipes – named after South African mining town, Kimberley where the pipes were first discovered in 1871. When the magma cools down, it turns into Kimberlite rocks; the material in which diamonds are found. Diamonds are then mined through various methods. One of the most common ways of recovering diamonds from the earth’s surface is through open pit mining – a process in which rocks are blasted until kimberlite pipes are exposed. A more complex form of diamond mining is through underground mining; this process usually depends on the size of the kimberlite deposits. Then there’s alluvial mining which refers to the mining of diamonds further from the kimberlite deposits such as mining through river banks and lastly, marine mining where diamonds are recovered out at sea. To achieve the perfect balance of fire, brilliance and scintillation rough diamonds are hand-selected by Shimansky at the South African mines. To this day, South Africa remains one of the world’s leading diamond producers, both in terms of quality and quantity. After the rough diamonds are hand-selected at the diamond mine, they’re transported to the Shimansky workshop. During this time the diamonds will undergo a mapping process using a diamond machine called, the Diascribe – this remarkable piece of equipment will determine the so-called DNA of the stone. With a vacuum-like effect, the rough diamond will be kept in place, while a different stage lens determines the size and shape of a diamond. During the scanning process, the diamond is divided into two parts; Part A being the main portion of the diamond and Part B, the secondary sections of the stone. 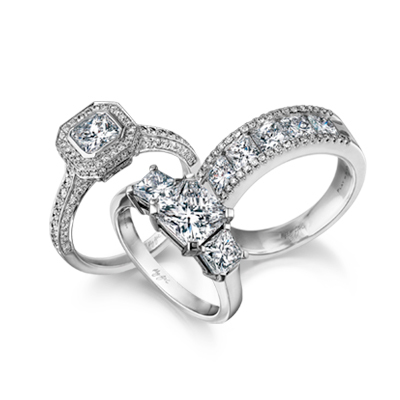 By using these calculations the craftsmen are able to determine the best cut of the diamond. After the sorting process, the diamonds are moved to the polishers table. With thorough instructions from the craftsmen, the diamond is then cut and polished into a beautiful faceted gem. This process requires years of expertise, knowledge and the latest state-of-the-art technology to achieve the Shimansky standard. Learn more about the steps in cutting and polishing a diamond from start to finish. Once cut and polished to perfection, the diamond will then be sent to an independent, international diamond grading laboratory such as the GIA (Gemological Institute of America) or EGL (European Gemological Laboratory) for grading. It is during this stage that the diamond receives it’s official 4Cs diamond grade – cut, colour, clarity and carat weight, that ultimately determines its value. After the diamond is polished and graded, it is given to a jeweller to be placed into mesmerising jewellery creations. During this process, the craftsmen will determine the different settings for the different jewellery pieces and gemstones. The master craftsmen use South Africa’s finest platinum and gold to fit the unique diamond; this is where authentic Shimansky designs such as the Millennium, My Girl and Two Hearts come to life. Once, this stage is complete the jewellery piece will then undergo a series of quality checkpoints before it will be available for purchase. Was it destined that this creation from the core of the earth, this piece of lattice carbon, would be the item that symbolises the strength and beauty of a couple’s singular devotion? Perhaps this jewel was always meant to be theirs, from when it was first formed beneath the earth’s crust billions of years ago. Diamonds will forever symbolise the love and commitment between two people and commemorate the special moments in our lives. The journey of a Shimansky diamond direct from mine to finger is truly a fascinating process. For a more in-depth insight into the world of jewellery making visit the Shimansky Diamond Experience at the Clock Tower Waterfront, Cape Town. Enjoy a one-on-one guided tour while witnessing master craftsmen transform a rough diamond into a beautiful one of a kind Shimansky signature design. Located at The Clock Tower, at the heart of the V&A Waterfront in Cape Town, the tour operates 7 days a week, from 9am to 9pm. Book your complimentary Diamond Experience Tour here.